An RSS (Rich Site Summary) feed is an XML file used to describe the contents of your website. As your website content changes, your RSS feed changes. Other computer systems, known as ‘aggregators’ or ‘harvesters’, read your RSS feed everyt once in a while. If you have provided new information, the aggregator takes that information and sends it to readers around the world. Thus information about your site’s contents is ‘syndicated’, that is, rebroadcast to a much larger audience. Take the text you have just copied and paste it into your text editor. Save this as a new file called (say) mysite.rss – you can call your saved file anything you want, but it is a lot easier if you indicate the name of your site and use .rss as an extension, just so people can tell by looking at the title what your file does. Remember to save the file in plain text format. Take a sip of the beer. You’ve earned it. You only need to create this part once. You can change it any time you want, but you do not have to. Once this part is done, therefore, it is done forever. Take a sip of your beer. You’ve earned it. This part of your RSS file is optional; you don’t have to add an image if you don’t want to. Your image will be used by some aggregators to provide some visual identity to your RSS feed. You will need to create an image first. Use any image editor (I use PaintShop Pro – http://www.paintshoppro.com/ ). Your image should be very small: my image is 90 pixels wide by 36 inches deep. You can either create a new image for your site image or do as I did: use PaintShop Pro to capture a bit of the site that looks nice, then reduce it in size. title: the title of your image, usually the title of your website. This is often used as an image ‘alt’ tag. As with the channel tag, once you’ve done this step once, you never have to do it again. This was a long step, so take a couple of sips of beer. An RSS file is an XML file. Some characters are illegal in XML. So you have to ‘escape’ them, that is, insert a text string in their place. Here is the list I use (not all of these are strictly required, but using this full list ensures maximum safety). Finish your beer. You’re done. Don’t forget to recycle the bottle. – Don’t forget the URL! Many URLs have ampersands in them. – For example: It’s his bike. becomes It&apos;s his bike. > – change every ‘greater than’ character to &gt; – but DO NOT change them in the tags. Strictly speaking, this step is optional, but it is strongly recommended since it’s easy to make a mistake on step six. 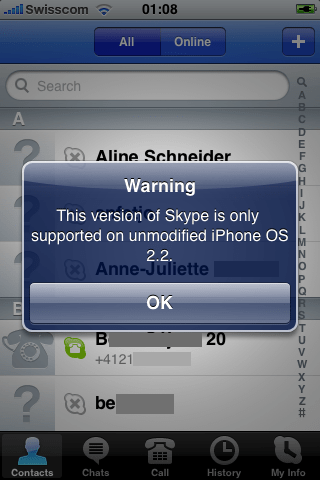 Why would Skype try to prevent users on jailbroken iPhones from accessing their software? It is simple. If you jailbreak your phone, you can use Skype over 3G. AT&T is really serious about killing VoIP on its network. It appears that not all jailbroken iPhones see the message, however ones that use the jailbreak to allow Skype to work over 3G are certianly targets.